Download the BIRT Runtime and extract the contents. Remove org.apache.xerces, org.apache.resolver and org.apache.serializer from the birt-runtime-version\WebViewerExample\WEB-INF\lib folder. WAR the WebViewerExample directory to birt.war. Install BIRT Runtime(e.g. birt.war from runtime download) through console. Click Enterprise Applications in left menu. 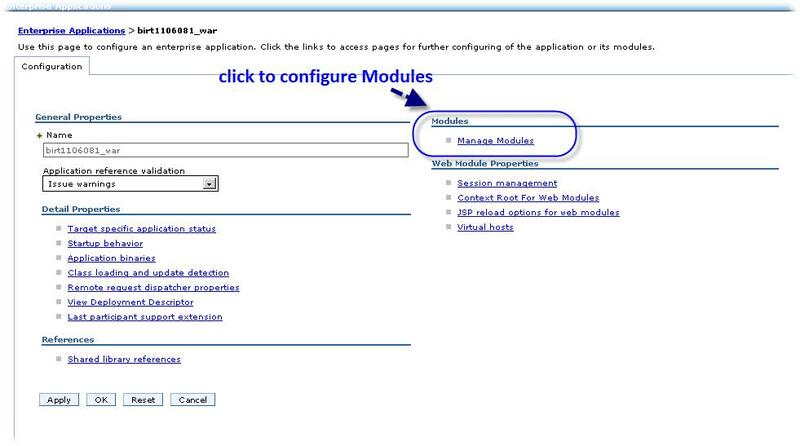 Click the name of the deployed application birt_war to enter configuration page. Click Manage Modules link in Modules. Click Eclipse BIRT Report Viewer in Module list. In General Properties page, select “Classes loaded with application class loader first” option for Class loader order, click OK. This page was last modified 09:28, 22 July 2011 by Aaron Digulla. Based on work by Jason Weathersby.